Kofi, a Jamaican reggae musician, and Keisha, a social researcher from South Carolina, meet at a club where Kofi's band is playing on the tail end of a United States tour. Kofi and Keisha come together that night, seeking relief from the uneasy circumstances of their life--Keisha still trying to make up her mind about an ex-lover who keeps coming back into her life, and Kofi realizing that he is teetering on depression and the tyranny of his older lover in Jamaica. Something happens in their first meeting and Kofi convinces Keisha to take a chance and follow him to Jamaica. She's Gone explores the complex dynamics of two virtual strangers trying to negotiate the complicated terrain of cultural difference, class difference, and issues of gender. The Jamaica that Dawes writes about is thick with the politics of class and identity, full of characters with distinct agendas and needs--a world quite different from the stereotype of sun sea and sun. Keisha feels immediately like a stranger on the island, and Kofi's return to Jamaica transforms him into a brooding man who finds comfort in withdrawing into himself. 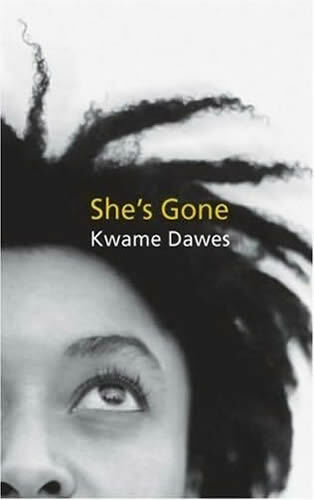 She's Gone delves into the psychology of desire and need as it contends with issues of culture and class. If it is a love story, it is one marked by the harsh realities of human existence that we see if the most revealing of Bob Marley's love songs, or the cool sensual intelligence of the best of Milan Kundera. Dawes is a poet but he never let's his poetry detract from the sheer pleasure of storytelling. "A masterly tour de force, the language here is elegant, seductive, and tender, the irony is sharp, the humor subverts, and hope shines through. Kwame Dawes is always reinventing the Caribbean narrative, fusing myth, legend, reggae, and his own sense of style to create a powerful and tremendous art. He never ceases to amaze." “ a novel from the heart and about the heart. The characters are true, the landscapes exquisite, and the relationships dynamic, insightful, and complex.